Please refer to our stock # Ohara 063 when inquiring. 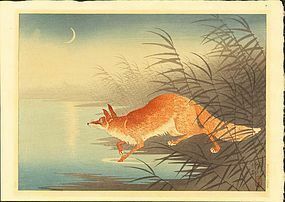 Fox between reeds near moonlit water. Size: Oban. Approximately 15.0 x 10.5 inches. Publisher: Kawaguchi and Sakai. Seal in left margin. Reference: No. S41.4, p. 212 in "Crows Cranes and Camellias: The Natural World of Ohara Koson" (Reigle Newland). Condition: Very good. Toning line evident at margin.